A TALL lineup which has speed for its main weapon. That's how Michael Oliver described his Batang Gilas team set to see action in the Southeast Asia Basketball Association (Seaba) U-16 Championship beginning on Sunday. The 12-man roster will be led by 6-foot-11 Kai Sotto and 6-foot-8 Shaun Geoffrey Chiu, jacking up the team's average height to an impressive 6-5. 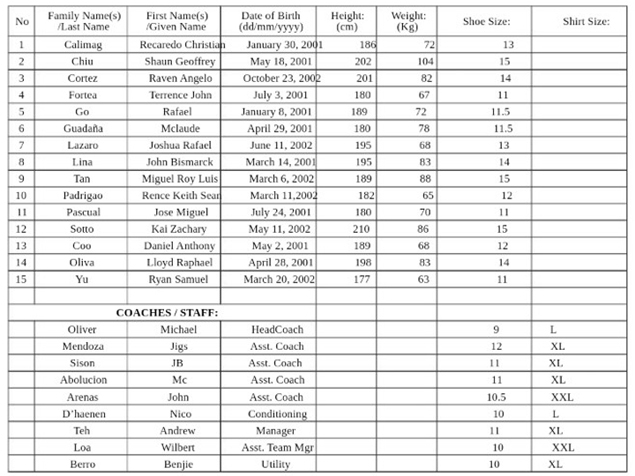 Yet the team will still bank on quickness in its bid to top anew the qualifier for the U-16 Fiba Asia Cup. "Speed pa rin," Oliver said when asked what will be the team's advantage from the rest in the five-team field during the Philippine Sportswriters Association (PSA) Forum at the Golden Phoenix Hotel on Tuesday. With Sotto and Chiu in the team are Recaredo Christian Calimag, Raven Angelo Cortez, Terrence John Fortea, Rafael Go, Mclaude Guadana, Joshua Rafael Lazaro, John Bismarck Lina, Jose Miguel Pascual, Rence Keith Sean Padrigao, and Miguel Roy Tan. Daniel Anthony Coo, Lloyd Raphael Olivia, and Ryan Samuel Yu are relegated as reserves, while the coaching staff is composed of Jigs Mendoza, JB Sison, Mc Abolucion, John Arenas, and Nico D’haenen. The Seaba U16 features Thailand, Singapore, Indonesia, and Malaysia in a single-round robin competition. The top three finishers earn berths to the Fiba Asia U16 to be held sometime in October or November. As it is, the Thais loom as the toughest opponent of the Filipinos in their bid for a top finish. While Batang Gilas has no idea on the composition of opponents since teams alter their rosters during each edition of the Seaba, Teh disclosed Thailand has one Thai-American in their lineup. “Umaangat na rin yung iba kaya we really have to go higher pa, para ma-maintain natin ‘yung competitiveness natin,” Teh said. Batang Gilas opens its campaign against Singapore on Sunday, and then takes on Indonesia the following day. The team takes a break on Tuesday before facing Thailand on Wednesday, and then capping its schedule by going up against Malaysia on Thursday.